An early warning system that could give Earth a week'snotice or more before a space rock destroyed a city would cost only $1 millionper observatory, its leading proponent suggests. Given current technologies, this lead time would not beenough to mount a mission to deflect the incoming object, but it could beenough to evacuate the area under threat. Astronomer John Tonry at the University of Hawaii mentioned anear-miss in 2009 as he stressed the need for anearly warning system against cosmic impacts. 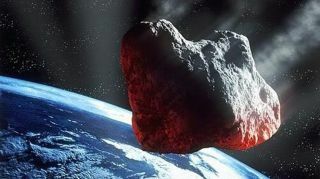 An asteroid the size of a bus exploded that Oct. 28 as itentered Earth's atmosphere over an isolated part of Indonesia. The burst of the33-foot-long (10 meters) rock packed the equivalent of roughly 50,000 tons ofTNT, more than three times the strength of the atomic bomb dropped onHiroshima. No one was reported hurt, but Tonry said objects of thatsize are likely to threaten Earth once per decade. According to estimates by Tonry and other researchers, therate of impactby asteroids at least 460 feet (140 meters) long is just once per 20,000years or more ? but the smaller the rock, the larger the risk. A roughly160-foot-long (50 meters) object like the one that devastated the Tunguska areain Russia in 1908 is likely to impact Earth about once every millennium, whilea 65- to 100-foot-long asteroid (20 to 30 meters) should strike once everycentury. The National Research Council estimated a 160-foot-longobject would cause an average of 30,000 deaths. Tonry details his analysis in a paper set to appear in theJanuary issue of the Publications of the Astronomical Society of the Pacific. "When it comes to something that dangerous, it justfeels incumbent to me that we at least look to make sure that things are okay ornot, now that we have the technology to do so," Tonry told SPACE.com. "Not looking would be like driving down a road without looking at yourrearview mirror just because you've never been rear-ended before. It'snuts." Developing a network of telescopes that can findcity-destroying asteroids years in advance, giving scientists a chance todeflect them, would take decades and cost hundreds of millions of dollars.Instead, Tonry and his colleagues are suggesting a network that in many cases couldgive the authorities enough notice to evacuate areas. Such a network could beconstructed quickly and cheaply, they say. "The performance you can get out of modern software,modern detectors and very modest-sized telescopes is surprisinglyinteresting," Tonry said. The network the researchers propose, dubbed ATLAS (for theAsteroid Terrestrial-impact Last Alert System), would consist of twoobservatories roughly 60 miles (100 km) apart that together would scan thevisible sky twice a night. Each observatory would house four relatively smalltelescopes some 10 inches (25 cm) in aperture, as well as a camera for eachtelescope. The distance between the observatories would provide a way ofseparating nearby and distant moving objects, and the system would be able tohelp pinpoint the location and time of an impact to a few miles and a fewseconds. Each telescope and each camera would cost roughly $50,000.The software would take up the lion's share of expenses, bringing the cost foreach observatory to $1 million. Tonry also projected $500,000 annually forstaff, maintenance and other operating costs. He and his colleagues havesubmitted a $3 million proposal to NASA to build two observatories and operatethem for two years. ATLAS could provide three weeks' warning for 460-foot-longobjects and one week's notice for 160-foot-long impactors. The smaller theobject, the less warning there would be; a 65- to 100-foot-long asteroid might drawtwo or three days warning, while 33-foot-long objects might get one. As currently proposed, ATLAS would detect more than half theimpactors longer than 160 feet, and nearly two-thirds of those 460 feet long.The chances of detection go up with more telescopes, Tonry said, which wouldallow ATLAS to compensate for cloudy weather or lack of coverage in theSouthern Hemisphere. Still, ATLAS' detection rate would never go higher thanroughly 75 percent, since it could ?spot objects coming from the blindingdirection of the sun. Tonyy added that ATLAS could monitor changes in the sky broughton not only by asteroids, but by a wide range of phenomena: supernovas,quasars, gravitationallensing events, asteroidcollisions in the main belt, variable stars, gravity waves, space junk, dwarfplanets. "We want to put ourselves in the way of discovering theunexpected," Tonry said. The space agency is now waiting for its budgetappropriations from Congress. More details on ATLAS are available at theproject's site, Fallingstar.com.